POOL STEPS, POOL LADDERS, POOL DECKS AND FENCING. Make getting into and out of your pool easy with one of our beautiful pool ladders or pool step systems. 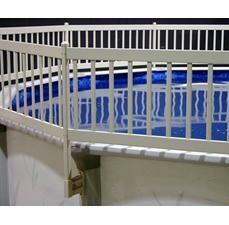 We carry pool ladders, pool steps and deck systems and fencing for both above ground and in ground pools. Check out our wide selection of step entry systems for one at fits your needs and budget. 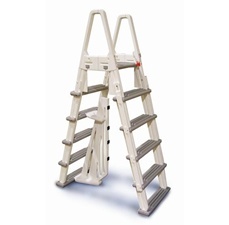 Replace your old flimsy pool ladder with one of our rugged, top quality ladders. We have the ladder for your pool, whether you have a deck or not, plus ladder enclosures for extra safety. Add an affordable Pool deck system to your pool and have a blast this summer. Keep your pool safe with our high quality, easy-to-install above ground or in ground pool fencing packages. Protect your pool from unwanted intrusions and help prevent accidents with this attractive, innovative pool fencing. Expert Advice customerservice@pcpools.com. 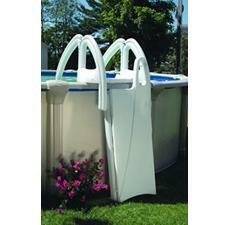 Beautify your yard and pool area with one of our beautiful pool step systems or above ground pool ladders. Protect your pool from people crawling over the edge and causing damage which could result in pool failure. We carry a wide variety of step and ladder systems to give you the option to choose one that fits your budget and requirements. 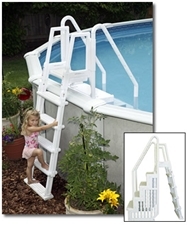 An appropriate pool ladder from PCPools.com will make entering and exiting the pool much easier. Replace your dilapidated and flimsy ladder with a system that includes a ladder enclosure and fencing. Prevent unwanted guests and intruders, as well as accidents, with our innovative and attractive pool fencing. Add the whole pool deck system for safety and maximum aesthetic appearance. Whether or not you have a deck, we have a pool ladder and optional ladder enclosure for your pool. Check out our easy-to-install above ground fencing packages. Our top quality, rugged above ground pool ladders have sturdy handrails, solid construction, anti-entrapment barrier, generous weight limit and generous warranties. PCPools.com has ladders and steps for those above ground pools that do not have a deck that borders the edge of the pool. This requires that the steps or ladders must be anchored. This is best done with a step or ladder unit that is both inside and outside the pool. Of course, a safety device must be installed on the steps or ladder to prevent unauthorized or unsupervised access to the pool. 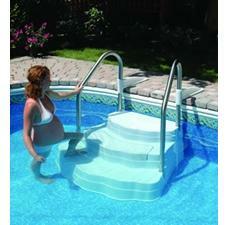 PCPools.com also has drop-in steps, hollow plastic sets of steps which allow easy entrance and exit of the pool. Pool fencing is a valuable safety feature making it difficult, if not impossible, to crawl over the edge into the pool. Fencing helps to keep intruders out, prevents drowning and keeps water games and toys in. Besides being utilitarian, fencing makes the pool more attractive. Pool decking serves in keeping dirt from being taken into the water on people’s feet, makes a nice, comfortable surface to eat, sunbathe, visit with family, friends or neighbors and dry off after a swim. A pool deck is a terrific place to be alone, to read, to relax or doze. Rejuvenate your tired looking above ground pool with new decking, a set of new steps or ladders. Add a ladder safety feature and a pool cover to protect the little ones and to keep the pool clean for everyone’s health sake.